I like pictures of walls. It seems to me they have much to say. This one, for example, talks of the house that it once supported, of the concrete small bunkers that were at its base. It has been there longer than the development called “Cherry Tree Walk” which is above Waitrose, to the left. And now, behind and above, is the new YMCA hostel. This wall is brick. It must have taken a long time to build. And it’s still there. Today was a glorious sunny day. I walked out into the sun and everywhere was worthy of a sketch. Here is 88 Golden Lane, a strange thin building. It is an architects’ practice: Blair Architecture. I sketched this standing on the side of the road in the sun, then retreated to sit on my case by a nearby wall to add the colour. Because the school closed, she left at 14. “I wanted to go to the art school, St Martins, but that was closed because of the war.” So, she said she’d be a typist. Then the firm she worked for closed down because of the war. “So I went on War Work,” she declared. “Oh, I’ve had a good life. I’m 93. Although people say I don’t look it.” She certainly didn’t look it. I suggested she take up art now. She waved her balled hands cheerfully and pushed her trolley on. She turned round. “I hope to see you again,” she said. Galway House is one of the two Towers on the Pleydall Estate just North of Old Street. The other tower is Grayson. I drew this from behind Grayson House. There was a ferocious cold wind. I seemed to have picked the place where all the winds met. Here are maps showing the direction I was looking. Here are the blocks in the picture. It almost looks as though the Atlas Building continues the march of these majestic 1960s blocks. But it doesn’t, not really. 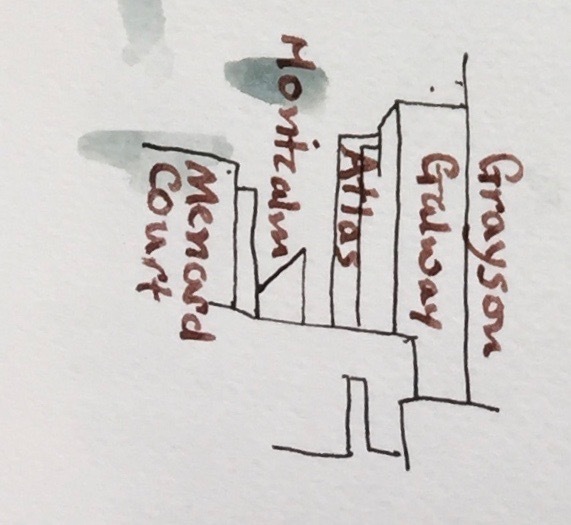 In the drawing you can see the scaffolding on the Atlas Building, and the external lift that was going up and down as I was drawing. I was interested to see that the inhabitants of Galway Tower made use of their flower beds. Raised flower beds in Galway House, South side. I’ve seen the same arrangement of raised flower beds next to the flats in Rahere House, where the beds were more exposed, and not used. This whole area underwent huge changes in the twentieth century, although the street layout is unchanged. From 1751, on Old Street, there was a huge hospital for the mentally ill: St Luke’s Hospital for Lunatics. This hospital was closed in 1916 and the residents moved out. The building was acquired by the Bank of England and used for printing bank notes. Bank of England Printing Works on Old Street, 1925, image credit: Bank of England Museum. 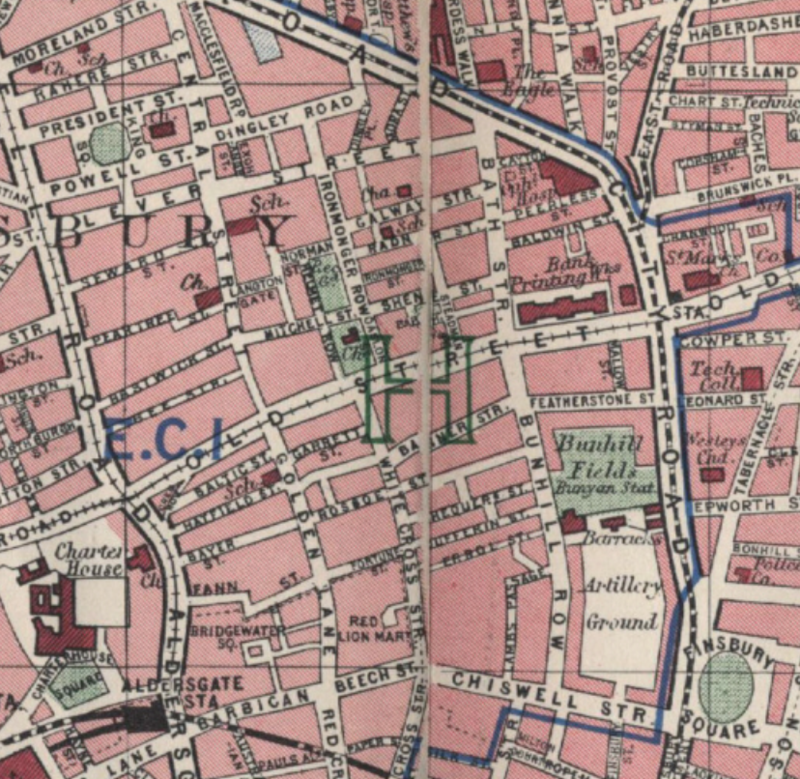 Here is the area in 1940: map from http://www.maps-of-london.com, click to enlarge. You see Galway Street on the crease of the map, in the centre about a quarter of the way down. Below it, to the right is the “Bank Printing Works”. In 1959 the London County Council sought to purchase the Printing Works site and use it as an annexe to Covent Garden. This was opposed by Michael Cliffe, MP for Finsbury and Shoreditch, on the grounds that it would create unacceptable traffic congestion, especially at the Old Street Roundabout. Mr Cliffe must have prevailed. I feel an affinity with him because earlier this week I drew Michael Cliffe House. The Printing Works building was demolished in 1963. At around that time Finsbury Council was building council houses, including the 4 tower blocks in the area: Gambier House, Grayson House, Godfrey House and Galway House. So somehow the Council must have acquired the Print Works site. I can’t find the history online so I’m going to visit the London Metropolitan Archives and the Islington Museum. 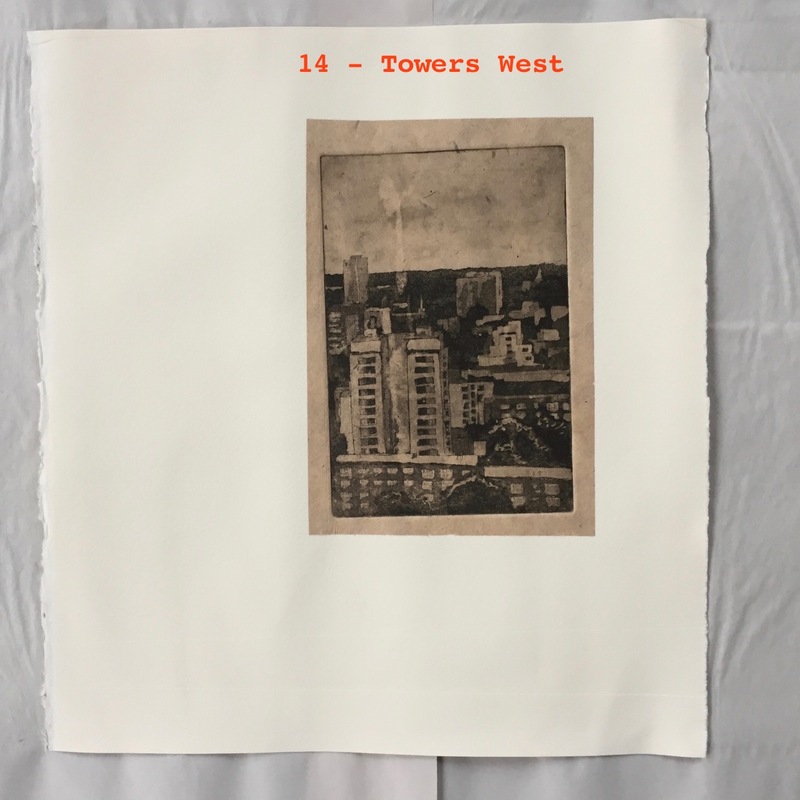 The Towers also were allocated to different Estates: Galway is in the “St Luke’s Estate” which includes the Printing works Site, Gambier is in the City Road Estate and Grayson and Galway are in the Pleydell Estate. From “Streets with a story, The book of Islington” (1986) by Eric A Willats FLA I learn that: “Messrs. Emberton, Franck & Tardrew were the architects of Galway House (Pleydell Estate)”. The Pleydell Estate, Galway House in the Background. 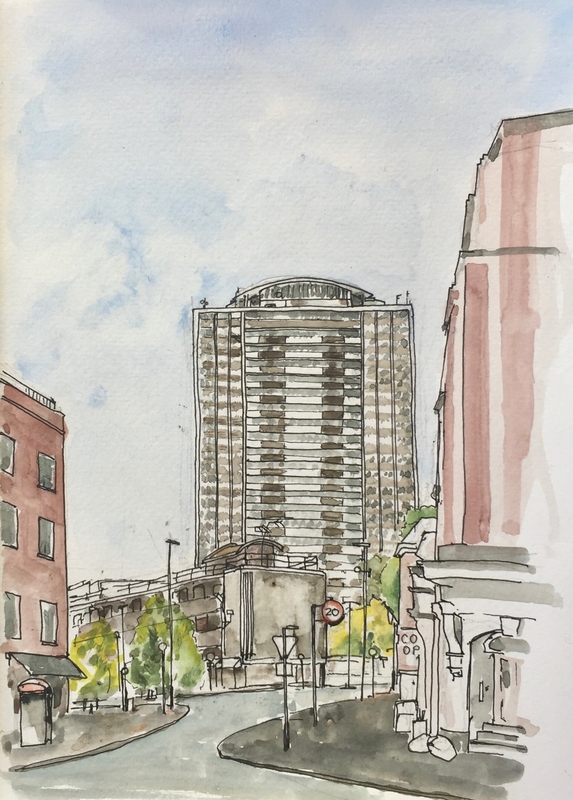 Here is Michael Cliffe House, in the Finsbury Estate, from Tysoe Street. The lower level block in the low centre of the picture is Joseph Trotter Close, also part of the Finsbury Estate. While I was drawing the picture a man came and told me that he had seen the original architect’s drawing of this low level block. In the architect’s vision it was “sleek and wonderful”. But the man said the reality was very different. The concrete had worn badly and the building had not succeeded, in his opinion. Earlier a woman came when I was at the pen-and-ink stage. She said that her 11 year old grandson had started painting, which pleased her very much. She bought paints for him. I asked if she painted too. She said no, but she was inspired by her grandson and might now have a go herself. “After all,” she said, ” he just paints anything, and I could do that too!”. I agreed. The drawing took two hours. After I finished I went to have a look at Joseph Trotter Close. I saw a low-level set of bungalows, all very much inhabited, with children’s play things and outdoor chairs on the lawn. It may not be sleek, but it looked as though people enjoyed living there. The entrance to Michael Cliffe House was cramped and congested, with cars manoeuvring awkwardly and a dark, obscured, entrance. Lovely typeface though. The real surprise was inside the entrance. There, uncelebrated in the underpass, were some amazing mosaics of dancers. Michael Cliffe (1903-1964) was a Labour councillor for Finsbury, Mayor of Finsbury (1956-7), and an active Labour MP (1958-64). The Finsbury Estate was built by Finsbury Borough Council in 1965. The architects were Emberton, Franck & Tardrew. Finsbury Borough council was absorbed by Islington. 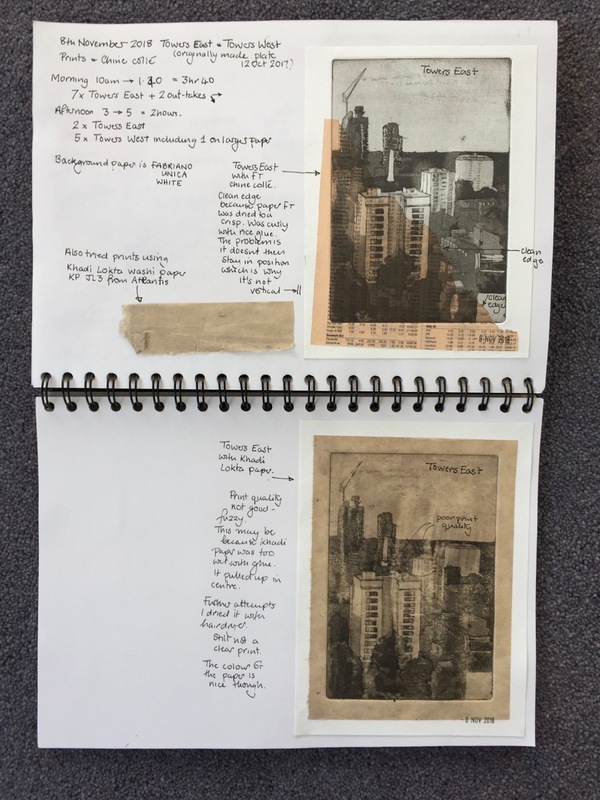 Later note (7th Feb 2019): There is detailed information on the Finsbury Estate on “British History online” – try this link, which starts with a history of Spa Green, and goes on to describe the Finsbury Estate. This week I made prints of an etching of the Atlas Building. The etchings are based on a sketch I made. I made 12 prints. Here they are. They fold in half to make a greeting card which fits in a C5 envelope. Equally they can be folded in half or cut, and put in a frame size A5. If you’d like to buy one, please contact me, and say which one you’d like. They are numbered – click the images in the gallery above. £5 each + postage. These are handmade items by me, an amateur printer. Thumb marks, imperfections, ink smudges and other defects reflect the handmade nature of the items and, as they say, “should not be regarded as defects”. This is all preparation for my “Towers” exhibition in February 2019. To see more detail on the process, look at this page, which explains all the stages. 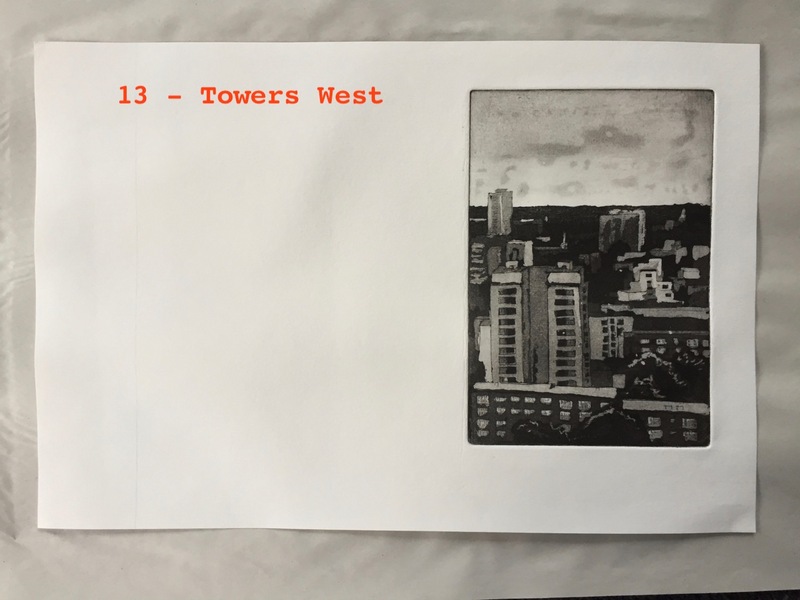 The photos above are in “East London Printmakers” in Stepney, where I do my work. Here is the original sketch on which the prints are based.